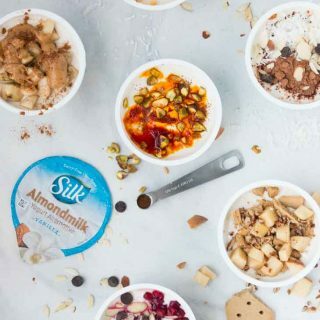 Treat yourself with one of these 6 delicious plant-based Healthy Yogurt Topping Combinations! They take less than 5 minutes to make, are creamy, and great for a grab-and-go breakfast, snack, or even dessert! There's one yogurt cup for each of the combinations (6 total). Open the yogurt cup, add in the toppings depending on which you are making. For the Instant Shrikhand - Soak the saffron in the water in a tiny bowl for a few minutes to get the flavor and color out. Then add this entire mixture to the yogurt cup. Eat immediately, or close back up using the top or seran wrap until ready to eat! This recipe uses SILK Vanilla Almondmilk Yogurt Alternative. If you choose to use the plain flavor, add sweetener of choice as needed. Note if you use a liquid sweetener, such as maple syrup, this may contribute towards the consistency of the yogurt. The nutrition information below is based on the SILK vanilla almondmilk yogurt and an approximation of each topping variety above.